Teakwood frame with MDF sheet top & bottom is finished in spirit polish. Fitted with hinges, clips and index card holder hardboard sheet with 20 apertures for 75x25mm specimen tubes fitted inside. Our company has created niche in the field of offering Green Leaf Hopper Insect Rearing Cage to the clients. But large size show-case with folding hinged lid. We are the manufacturers of Insect Showcase Cabinet, In which acrylic or glass is used on the top of the Insect Display Boxes and also on the Door. It has locking system also. Eva Sheet 6mm is pasted on the bottom for pasting and pining insects. It is Export Quality product. 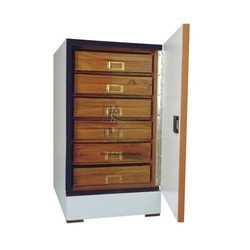 With a firm commitment to quality, we are involved in offering a wide ambit of Insects Cabinet. RI-64-01: Insect Showcase Cabinet (Small) with 6 Show cases. 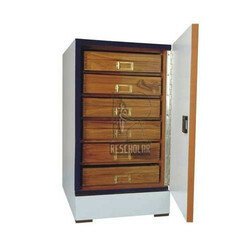 RI-64-02: Insect Showcase Cabinet (Small) with 12 Show cases. RI-64-03: Insect Showcase Cabinet (Small) with 24 Show cases. - Teakwood frame finished in spirit polish. - 4 mm thick glass on top and fine wire mesh on three sides. - Front with 13 cm rounded opening in th centre with black cloth sleeve. - On right side a plumbiv pipe fitted for collection of flies. Owing to our strong market presence, we are engaged in manufacturing a premium quality range of Insect Showcase Cabinet Large. We are pioneers in the production of exclusive collection of Insect Cabinet Cell that are especially engineered using advanced manufacturing facilities. Made from quality tested materials, entire process is controlled by our proficient team of experts to ensure flawless production. Our clients can obtain them at the competitive prices from the global markets as per their expectations. The insect showcase cabinet we supply is used for insect storage and as a display showcase. It has an excellent design. The insect showcase cabinet frame is ply board finished with laminated sheet. A hinged door is provided with look and handle and is lined with velvet. The insect showcase cabinet is durable and easy to maintain. Wooden frame with silk screen net on sides. Top sliding planks of MDF covered with black cloth from inside. Combs for removal ofinsects from plank.